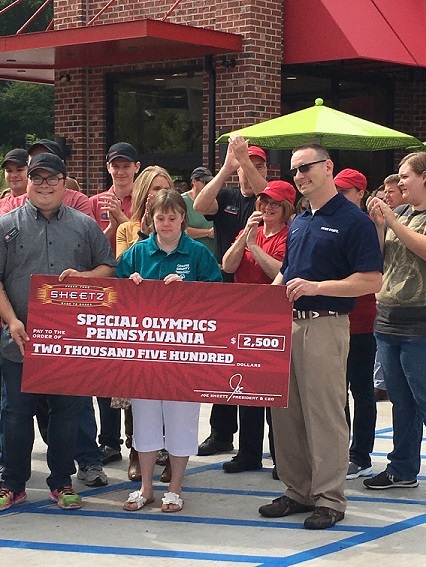 The Sheetz family opened a new store in State College on August 31, 2017 on Colonnade Dr. and following their tradition, they invited Centre County Special Olympics to attend the festivities and to accept a check for $2500. Half of the money goes to the state organization and half ($1,250) is donated to our local program. That will cover the cost of transportation to our fall competitions! Just like its signature deli treats, Sheetz is definitely our MTO friend (Made to Order). Accepting the check was Jenny Kunkle a Centre County athlete training in basketball, bocce, and volleyball, and SOPA board member Dr. Peter Seidenberg. Many thanks to the Sheetz family and all its employees for being generous supporters of Special Olympics. Don't forget to drop your spare change in the collection cans at each store next time you visit....it's for a great cause!